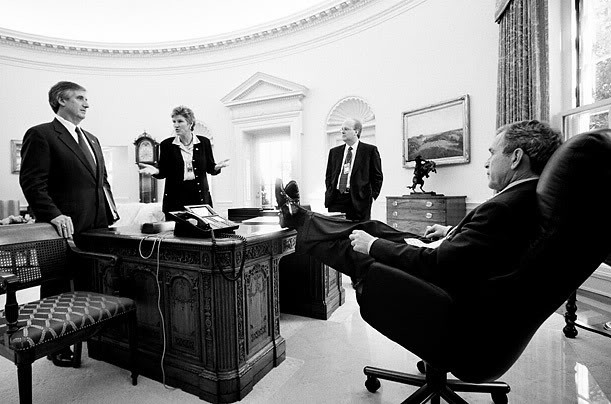 Photos of President Obama With His Feet on the Resolute Desk-Truth! - Truth or Fiction? 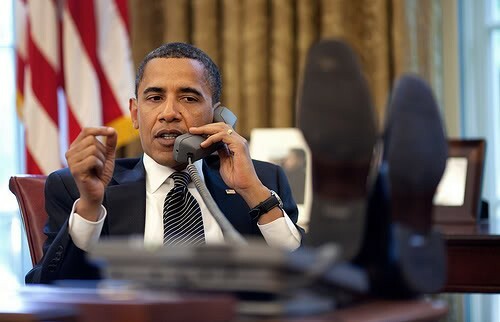 Photos of President Obama With His Feet on the Resolute Desk-Truth! 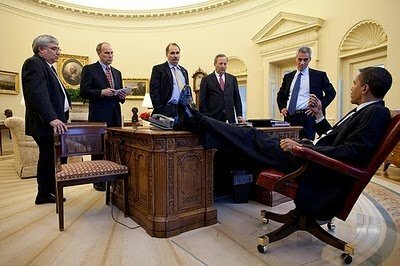 Photos of President Obama With His Feet on the Presidential Desk-Truth! 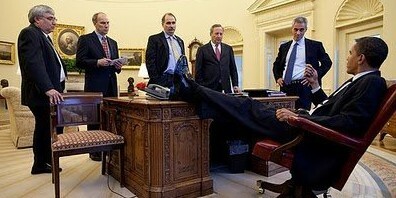 A forwarded email with a photo of President Obama with his feet on his desk during a meeting with his staff. The email says that this desk was a gift to the United States from England’s Queen Victoria and this is a sign of disrespect. The photo is real and it is not the first time President Obama or an American President has been caught with his feet on the famous Resolute Desk which is currently in use in the Oval Office of the White House. In the United States, the putting of feet on a desk is not automatically interpreted as a sign of disrespect but placing feet on an American historical landmark in the most important executive office in the land is interpreted by many as an entirely different matter. Etiquette advisor and expert, Gloria Starr, told TruthOrFiction.Com that she would view this as inappropriate behavior and a sign of disrespect of an item valued as part of American history. The White House photo below also sparked controversy when it was taken as President Obama was on the telephone with Israeli Prime Minister Binyamin Netanyahu, according to a June 10, 2009 Huffington Post article. Click for article. President George W. Bush also put his feet on the Resolute Desk. The eRumor refers to the Presidential desk as the “Resolute Desk,” which is how the famous desk is known. The desk got its name because it was made of the wood from the HMS Resolute, a British sailing ship. In 1852 the HMS Resolute set off on a 2 – 3 year mission along with four other ships to the Arctic. This was a mission to investigate the disappearance of two ships, the Erebus and Terror, which left England in 1845 in search of the North West Passage. As planned, the rescue ship became trapped by ice twice which carried them closer to their destination. Eventually, the crew protected the vessel from the elements and continued on their mission on foot. The abandoned British ship that was found 1200 miles from where her crew left her by the U.S. whaling ship George Henry in 1855. The George Henry crew managed to free the entrapped Resolute and sailed the salvaged prize back to New England where she was sold to the American government. As a gesture of peace and esteem Resolute was repaired, refitted and eventually returned to England. In 1878 the ship was decommissioned and Queen Victoria ordered a desk to be fashioned from the wood of the Resolute. She presented this desk as a gift to President Rutherford B. Hayes in 1880. According to the White House Museum web site, every president since Hayes has used the Resolute Desk either in the Oval Office or a private study in the Executive Mansion with the exception of Presidents Johnson, Nixon, and Ford. President Franklin Roosevelt requested that a panel be installed at the front of the desk to hide his braces and wheelchair but the panel project was not finished until after he died. President Truman was in office when the panel was installed. Click for White House Museum page on the Resolute Desk. 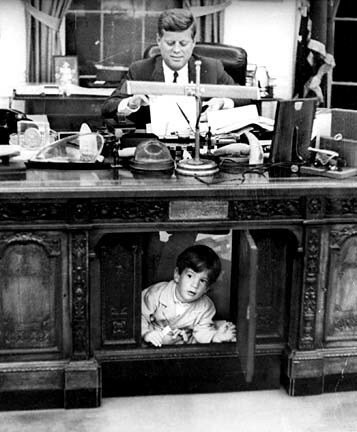 The best known photo of the Resolute Desk in the Oval Office shows John F. Kennedy sitting at the desk with his son, John Kennedy Jr., peeking out from a panel that was installed to hide President Roosevelt’s leg braces and wheelchair. Does this photo of President Obama in the Oval Office convey anything about his attitude?